Just the other day a couple of us were laughing and shaking our heads “yes” as a mom shared that she was having detailed dreams of things that had happened with her kids for which she felt guilty. She shared how she texted her college-age student one evening when she thought of something she had done–and apologized. I love that she did that. After all, hurts can take up residence in the heart of the person we’ve wronged and stay there a lifetime. Apology can be a great way to ease the burden for the other person and for us. As most of us have experienced, Mom guilt is a thing. We’ve all gone down that path a few times when we’ve said or done something to our kids that we regret. Or maybe it is something we wish we could do for our kid but we can’t. I thought is was a great line and so true. Humor aside, as moms we all know that we’ve made mistakes and will continue to make mistakes in our parenting. But do we need to feel the heavy guilt for what we’ve done? Think about that for a minute. What’s the difference? Guilt versus sadness and regret. As I tried to wrap my brain around her comment, the wisdom of what this woman was saying spoke volumes. Guilt implies that you knew what you were doing at the time was wrong. Read that last sentence again. Guilt implies that you knew what you were doing at the time was wrong. There are times when we don’t know what we don’t know, so we can’t be guilty. To me that is freeing. In my own life I’ve learned to look at things through a lens of not being responsible for everything that happens with my kids. Let me explain. None of us are God. We can’t know everything. There are things we will be blind to until God opens our eyes–typically through a painful event that leads to wisdom. Our kids didn’t come with an instruction manual. We learn parenting by trial and error and we will make mistakes. But most times we don’t know our parenting decisions are mistakes until we see the outcome that proves we should have taken a different approach. That’s when God peals the blinders from our eyes. That is where we gain wisdom. So what can we do to get rid of the guilty feeling that the reason our kids are doing bad things, making poor choices, or are struggling is because we weren’t a good enough parent? How do we deal with the judgment we are heaping on ourselves making us believe the lie that we are terrible parents? Take the guilty feelings and leave them at the foot of the cross. Ask God to help you see truth in that moment. Did you have the knowledge and wisdom that you do now? There is no condemnation in Christ Jesus. Romans 8:1. Learn to accept that we aren’t perfect nor will we ever be this side of eternity. We can only parent with the knowledge and wisdom we have at the time. Forgive yourself for the mistakes you’ve made. Let God’s mercy wash those feelings away and ask Him to right your wrongs in your kids’ lives. With God all things are possible. Matthew 19:26. Apologize to your child for the things that come to mind. Even if it happened a decade ago, letting your child know that you are sorry for what you did at the time lets them know you are human and models accepting responsibility for our own mistakes. If your teen brings something up, apologize, empathize, and if they are ready to listen, share why you made the decision you made. Be sure to give them a hug and let them know they are loved. When guilt rears its ugly head again, and it will, have scriptures available to keep you from the pit. After all, whatever you have done, whatever guilt or shame you feel, He allowed it to happen. He works all things together for our good. Romans 8:28. “Oh how I feel guilty for things that I have done or should have done with my child. I know that I did the best that I could with what I knew in the moment. You created ___________ as a separate human being who has free will. And that’s kind of hard for me to fathom. At times our lives are so intertwined that I wish I could help them see what’s best for them. I’m sad for their choices; however, I know that I cannot own the decisions they’ve made. I am not God. Lord, You are weaving a tapestry that I will not fully comprehend this side of heaven. Please help me to pray without ceasing and let You be God in this situation. My child is yours, Lord. You’ve only given him to me on loan. Help me to do the best I can in each and every moment so that You will receive the glory and honor. Would you like to learn more about letting go of the guilt we put on ourselves as moms? 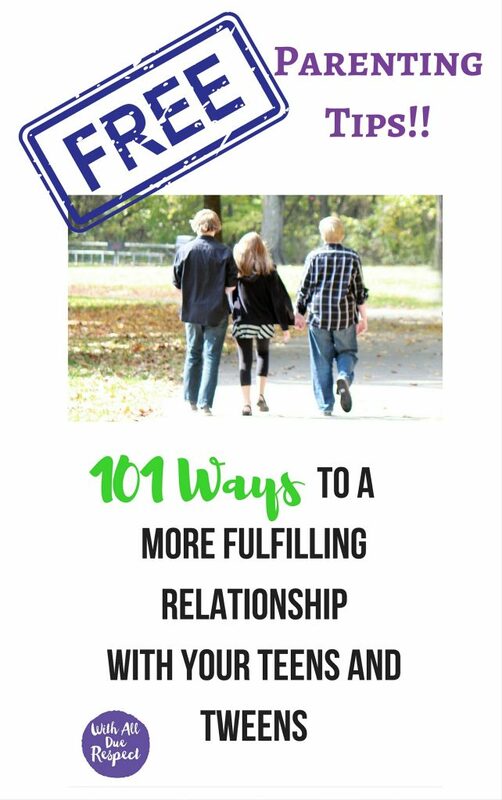 Would you like to deepen your relationship with God and your kids? With All Due Respect isn’t just a book. It’s deep thinking curriculum that will help you look at yourself as you parent. It will give you insight as seen through the lens of moms who are farther ahead in the parenting arena. Why not pick up your copy now or better yet, do it in a small group? Don’t have a small group? You can join our eCourse with women across the country that are learning how to connect on a deeper level. 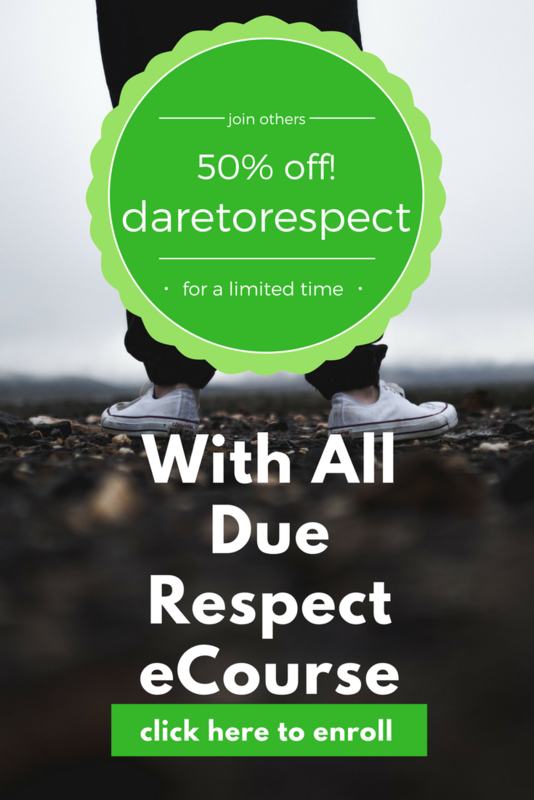 There you will find support from your eCourse mentors as well as myself. Hope to see you there. This was so helpful today. I just got through a weekend where I was pretty crushed so this helped put things back in perspective. Kathy, I’m so sorry about your difficult weekend. Our mama hearts can be crushed so easily as we watch our kids make choices different than what we would like. Praying that you can remember that God knows your heart and He holds no condemnation. Glad that the blog was helpful in turning your thoughts back to Him. (((Hugs))) and praising Him for perspective. Thanks for being on the journey.